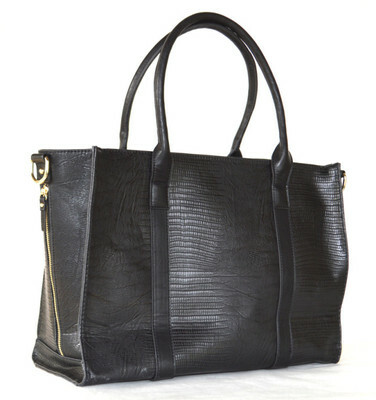 This is the Juno Blu bag I reviewed the, Esalen Tote in Black Lizard. Winner of the Eco Excellence Awards & Family Choice Awards is Juno Blu breast pump bags. The idea came from two breastfeeding, working, on the go mothers Shannan & Kelley. They couldn't understand why there wasn't a bag designed for the on the go breastfeeding mommy. Sure they have those big, bulky breast pump bags that sometimes will come with the pump, but those usually just hold the actual pump and nothing else. A Juno Blu bag fits the needs for the breastfeeding mother wonderfully. It serves as an all purpose bag. 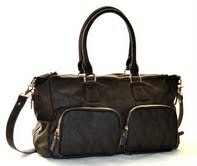 One could use it as a diaper bag, pump carrier, & a purse, all at once! Well I was pleased to see how many different items you could carry in a Juno Blu bag rather than just the pump. In fact the pump area of the bag is in it's own little world, completely separate from the rest of the bag. I thought that was pretty brilliant. The side compartment that you see unzipped is where you put your pump. 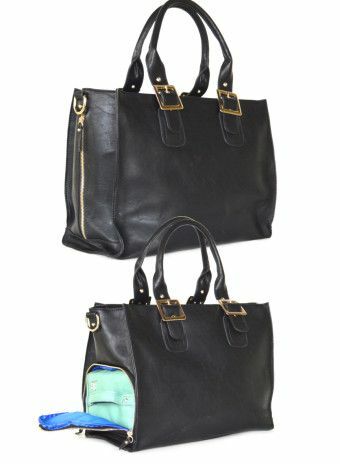 As you can see by this unique design you can hide your pump on the side compartment then you have the rest of the bag to use as a purse and or diaper bag. It's so discrete in regards to hiding the pump in it's own little compartment that people didn't even realize that it was any kind of breast pump bag. To everyone else it looked like a designer bag. It was only when they would ask me the brand name so they could get one for themselves (not breastfeeding mothers) they were shocked when I added breast pump bags after saying the brand name Juno Blu. Something else I found out that I thought was pretty fantastic aside from actually reviewing their bag was that they donate a portion of every sale to Best For Babes. The mission of Best For Babes is to beat the booby traps that prevent mommies from achieving their breastfeeding goals. I find that pretty spectacular, because I'm a breastfeeding advocate so I think that would be one of my favorite parts above all else about Juno Blu. Dust Cover for the bag. I thought the fact that they put those dust covers on their bags to ship them was such a small yet significant detail that shows how much care they put into their product. You can fit a lot in the bag! I received so many compliments in just the short time that I used the bag. 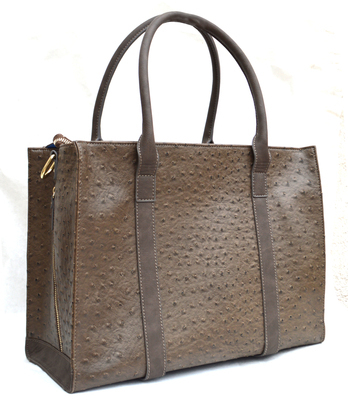 I would definitely recommend this bag to anyone. It's a bag that will definitely be used far after my breastfeeding needs are over with. Shannan and Kelley put a lot of care and thought into their product and I always see them around social media trying to be attentive to the current needs of not only their clients, but mommies everywhere!